The on-going demand for a separate state for the Nepali-speaking regions of West Bengal flared up earlier this year in a prolonged strike in Darjeeling and Kalimpong and surrounding areas. Fortunately, we didn’t have any volunteers in the area at the time, but we had to put our volunteer programme on hold while the strike lasted. Tourists were bussed out, but the intrepid Annie Taylor, who makes an appearance in these newsletters every year, managed somehow to evade the pickets on the roads and returned to what is now her second home, the JN Memorial School. I conducted the annual inspection visit to the Himalayas in October, this time visiting Nepal where I visited the Women’s Empowerment Centre (WEC) in the south-east corner of the country, and also a HELP-supported school in the Kathmandu Valley and a remote school in Western Nepal that is still under construction. I met up with Ben Coleman during the visit, and we were able to meet some of HELP‘s sponsored children. I was taken aback by the damage caused by the 2015 earthquake to the architectural heritage of the Kathmandu Valley. 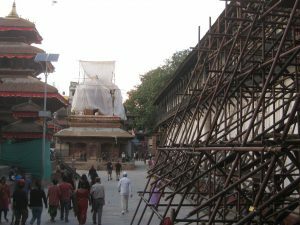 Here is a picture of an ancient building in Kathmandu’s Durbar Square being propped up with bamboo poles. Several temples have been reduced entirely to rubble (and whole villages in the mountains too). Very little restoration work seems to have been done. It’s at the Women’s Empowerment Centre in Damak that we get closest to the heart of darkness: an underworld of abuse usually committed by men against women – and not just any men, but fathers, husbands and boyfriends (we men harbour some nasty latent tendencies). Seven of our supporters clubbed together three years ago and co-sponsored a young woman, who had been severely burnt by her father, to enable her to undertake a nursing course. I met her this October, and, in good English, she told me about her course, but then, in thanking me, broke down in tears. She is clearly still traumatised by her misfortune, made worse by returning to her home town of Damak where she is assaulted by her memories. I was told that when she was not attending classes, she did not venture outside. However, she has passed her exams. We can only keep our fingers crossed that her sponsors’ generous intervention will enable her to make something of her blighted life. My sincere thanks to Theresa, Cathal, Anne, Terry, Jochen, Huyen and Charles for giving her a chance in life. Since then more sponsors have stepped forward to sponsor the children of women being cared for by the WEC. In addition to sponsorships, HELP has been contributing to the rent of the WEC’s premises for three years, and the third and final instalment of £550 will be sent in April 2018. This has enabled them to expand their premises to include 3 rooms for a safe house facility. The WEC needs financial help to run a six month advanced sewing training course for more than 60 of the women who have passed their basic training. This will set them on the path of self-sufficiency. 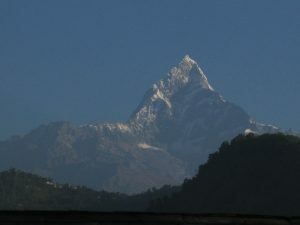 The cost would be 90,000 Nepalese rupees ( $875). Would you be willing to make a contribution? If so, please complete our donation form. Annie Taylor returned to the school yet again this year (the seventh year running!). 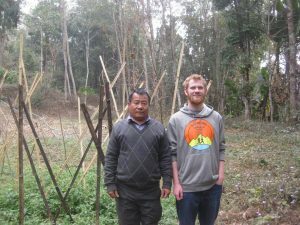 She has been an invaluable ally over the years in checking up on the way our money is used, and in meeting the sponsored children in and around Kalimpong. This year HELP has sent the school £1030 for desks. In January, Ben and I had the pleasure of meeting Liam Campbell who, as I reported last year, has raised money for badly needed new classrooms, and had returned. You can see in the accompanying photo Liam and Dinesh Rai on the plot of land above the main school building where the new classrooms will be constructed. I handed over to the school principal HELP’s contribution of £1,000 to Liam’s project and also £330 from Highfields School, which has kindly supported our programme for many years now. This year HELP has placed nine volunteers (including one nurse supporting a mobile medical unit in West Nepal) from across the globe: from Australia, Canada, the UK, the Netherlands and Germany. Once again many were experienced teachers, but all, whatever their experience, made a unique and valuable contribution to the schools that they worked at. However her time was not all spent in philosophical discussion! Volunteers frequently continue to support schools or the work of HELP long past their original assignment. 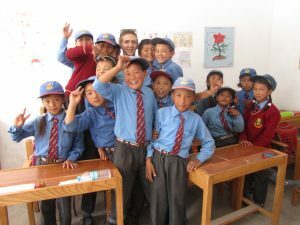 Three of our ex-volunteers returned this year to work at a different Himalayan school. 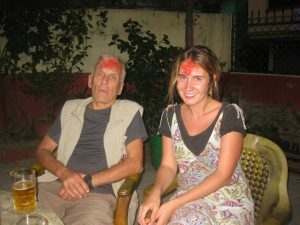 During my October inspection visit to Nepal, I was able to meet Bethany Moate the HELP volunteer nurse who was assisting a Belgian doctor on a gruelling tour of remote locations in Western Nepal to provide much needed medical help (mainly dental) to villagers. In the end they managed to treat over 1000 villagers – quite an achievement.These medical camps are run by a Belgian NGO, Himalayan Projects. We are pleased to be able to support their excellent work in trying to sustain these remote villages with educational and medical facilities and services. Without this kind of work, the villages will become depopulated as the younger members migrate to the towns. 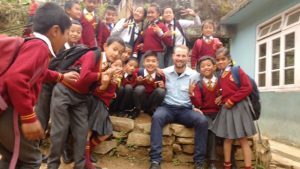 Here is a picture of Shane Lefevre who spent a couple of months at the Vidya Sagar Gyanpeeth school in West Sikkim with his pupils. Click on this link to read his blog post. 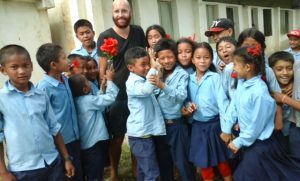 Some schools are so remote that a couple have a better chance of surviving the isolation than one lone volunteer. 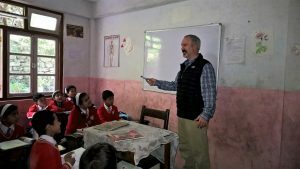 This year Anna and Les Johns volunteered at the remote SASA Academy in Uttarkhand, and emerged feeling very positive, and are continuing their involvement by sponsoring several SASA children. 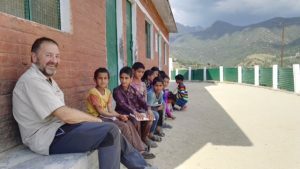 In March 2018, Barbara Porter will be running a seminar in Dehra Dun for some 30 teachers from around 30 local schools from the most backward rural areas of Garwhal district. 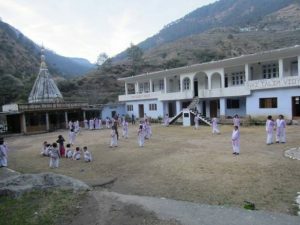 Unlike the other districts in the Garhwal region of Uttarkhand, which fell under direct British rule, these districts remained under the local maharaja’s rule and as a consequence of his neglect did not see any schools established until 1949 when the last ruling maharaja was forced to relinquish power–some 50 years after the British administration’s schools were first set up. The teachers in these schools are poorly trained or not trained at all. This event, which HELP is funding to the tune of around £1800, is the fruit of a more informal seminar held by Barbara in 2016. Having seen the quality of her training, Shailender David wanted her to return so that teachers from the most deprived areas of the State could benefit. Barbara hopes also to conduct informal teacher training workshops in the schools we support in this region during her forthcoming inspection visit. 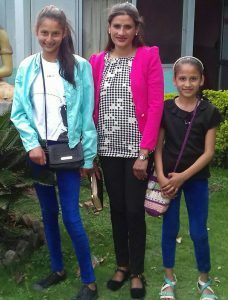 This is a picture of Mandira Bhandari and two of her children, Drishtee and Ditashma, who are currently being sponsored. We sent Mandira a one-off payment of £455 so she could complete a tailoring course which will, hopefully, give her the means to make a living. My special thanks to our unsung heroes, our HELP Representatives: Norong Namchyo, Ghana Koirala, Rajib and Radhika Thapa, Kiran Chettri, Shailander David, Samuel Khakha, Senir Nair, Rabin Acharya, and Jayanti Bai Lama for the difficult task of running the sponsorship programme on the ground. We continue to rely mainly on volunteer fees to fund our programme, and of course donations our friends send our way from time to time. And let’s not forget the taxman who has sent us £1510 under the Inland Revenue’s Gift Aid scheme! Gift Aid is an invaluable boost to our income, but we do need your permission from the donor to apply for it, even if we know you are a UK-based tax payer! We are very dependent on our network of friends and volunteers for the funds we receive, so a special word of thanks to all our benefactors! But here is a mystery: a credit of £1152 appeared in our bank account on 29th November and we have no idea who has sent it! Can any of you shed any light on this? Kerrie Ann Sullivan, one of our ex-volunteers, ran the Brighton Marathon in April 2016 – her first full marathon, and exceeded her target of £1000 in aid of HELP‘s programme. Undertaking a charity challenge is a great way to raise money. Unfortunately, since Kerrie’s effort no-one else has undertaken a chartity challenge on behalf of HELP. If you are planning to do something that you find challenging, then please don’t miss the opportunity to invite friends to sponsor you through our BT MyDonate page! Every year I plug the charity search engine called Everyclick which enables users to raise money for HELP through their internet searches, and by making internet purchases via the site’s Give as You Live service. So far we have, between us, raised £192.60 but we could do much better if more of you did your searches this way. It’s not quite as good as Google, but I use it for 90% of my searches. Here’s where to start. Easyfundraising is another, and better known, way of raising money by internet shopping, and we have not done enough to promote it. If Everyclick doesn’t click with you, then please do try Easyfundraising by doing your Christmas shopping through the HELP page on this website! It’s an easy and painless way to raise money for HELP.